Here's one of the new online slots from Eyecon gaming, the developers behind popular games like Fluffy Favourites and the like. 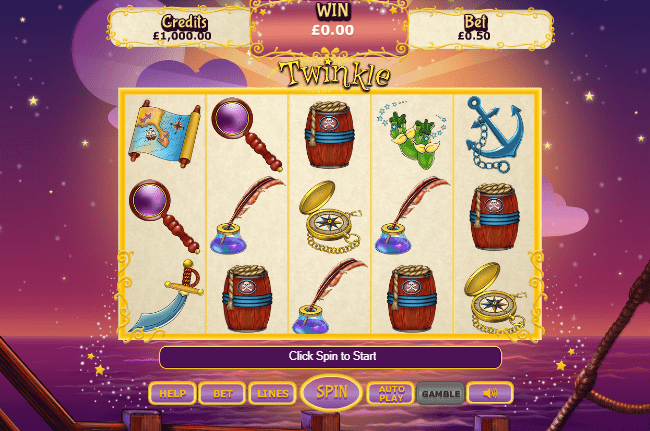 Twinkle is a simplistic 5 reel, 25 payline Slots Games that features a candid little fairy who will assist you on your journey to free spin success and keep your casino balance, rising, rising, rising. Start playing Twinkle on now! Not only is Eyecon a rising star in the world of online slots, but is also building a lasting legacy as one of the more user-friendly businesses simply due to innovation and passion. So many game developers lose sight on what is most important in the industry and are doomed to fail from the start. Eyecon play to the importance of this industry everyday, providing user friendly games that are sure to make you laugh, cry and cheer in joy as you see the money just rolling in. Look for the Eyecon logo wherever you can, this is like the bat signal for success. If you love promotions, visit SlotsBaby today. Twinkle, no not a start of a nursery rhyme, but a rather exciting slot from the minds over at Eyecon. This 5 reel by 25 pay-line slot takes players across the ocean aboard a rather suave looking pirate ship. We like to think that this slot is one that is inspired by Peter Pan directly, specifically because of the main character of this slot taking the shape of a fairy named Twinkle (not to be confused with Tinkerbell). This is a very attractive looking slot that is sure to serve attention from the moment eyes are cast upon it. We should also add that the soundtrack for this slot is one that is foot-tapping-ly good, there is however a mute button if you don’t enjoy fun. The lay-out here is one that is engulfed in gold, the border for this slot is one that is set about in its own particular way. Stars gleam in the midnight sky and create a sense of un-nerving as pirates normally have enemies. All symbols in this slot take the shape of a variety of different pirate-themed trinkets. Each symbol is clearly outlined from the other by the shape, size and the colour of each symbol. We recommend multiple spins in order to fully test-out multiple different strategies moving forward. Players who have played other Eyecon games can expect, wilds, scatters and free spins among other exclusive features. We’d tell you more but we find that players who discover these things for themselves tend to enjoy the games far more. Twinkle has layers, and one must unreel each layer to find fortune in endless spades.